Lauren and Nathan are two amazing, free-spirited, and laid back people in love. I first met them when they still lived in San Francisco. They moved to Taos, New Mexico in January (almost accidentally!) when they were visiting family and just ended up staying in that wonderful little town of art and culture in every corner. Since Nathan is an artist, he created his Art Den there. I arrived in Taos a few days before the wedding and I got the pleasure of seeing where they lived, their gallery, and all the little things that make this place so charming. 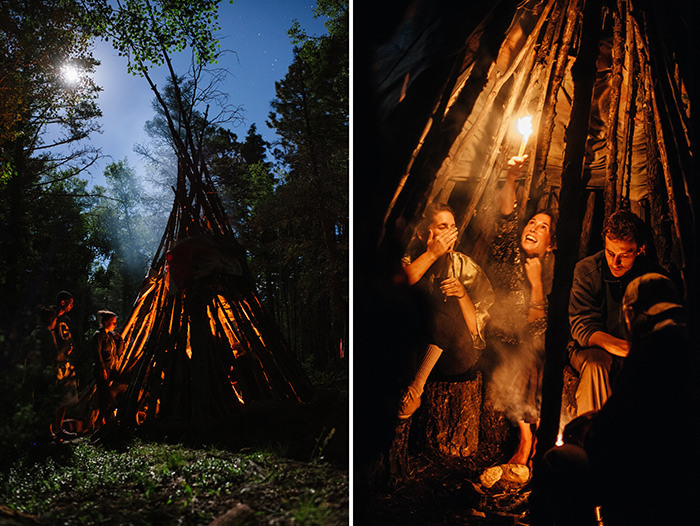 About two days before the wedding, Lauren and Nathan and their friends had a small bonfire of sage in a teepee that Nathan built. We were under the moon, which was so bright against the clear sky it created shadows out in the forest where we were. Two days later, at the El Monte Sagrado, Lauren and Nathan walked barefoot into the Sacred Circle and married each other under the beautiful aspen arbor that Nathan built. One of the greatest moments during the ceremony was the expression Lauren had on her face when she saw for the first time the wedding ring Nathan had picked out as he put it on her finger. Throughout the day, there were long hugs, laughs, and sage (not to mention the incredible dancing! Lauren and many of her friends are talented dancers). I wish I could write more about their wedding, but it's better for the images to do the talking. It's amazing to recognize two people so obviously meant for each other. People aspire to have the kind of love they have. Enjoy.